A Designated Driver Program is available to all guests of legal drinking age (21) who pledge to not consume alcohol and are a legitimate designated driver for a group consuming alcohol. All guests under the age of thirty (30) will be carded for alcohol purchase. A guest may not purchase/have in possession more than two alcoholic beverages at one time. Alcohol is not to be served to an impaired guest. It is illegal for anyone under the age of 21, to purchase or have in possession alcoholic beverages. Each individual guest possessing alcohol must have valid ID as proof they are 21 or older. Alcoholic service in all concession stands ends at the first pitch of the 8th inning. Alcohol service to the Suites ends at the first pitch of the 8th inning. The only animals allowed in Greater Nevada Field are certified service animals. Owners must have appropriate certification in their possession. Service animals in training will not be permitted to enter the Field unless they are authorized by the VP of Operations. The Fan Center is located on the Main Concourse behind Section 105, and is our centralized location for Aces services and programs provided at each home game. Information and services provided by Guest Relations and Lost & Found can all be found at this convenient location. Amplificative devices for guests with hearing impairments are available at Guest Relations located on the Main Concourse at Section 105. 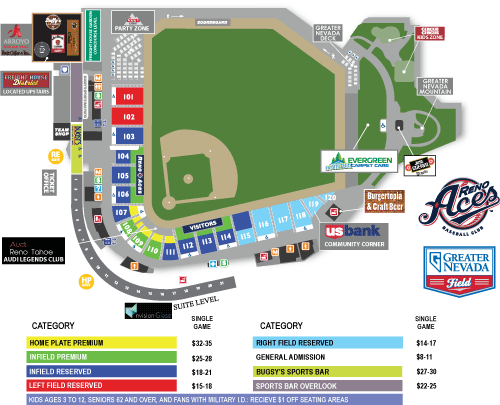 Guests may request autographs from the players from the time gates open until 15 minutes prior to game time from the outfield side of either dugout; however, consideration should be given to guests possessing tickets for these areas. -Main Concourse inside the stadium behind Section 101. -Main Concourse inside the stadium behind Section 105. -Main Concourse inside the stadium behind Section 113. Baby changing stations are located in every restroom at Greater Nevada Field. Please refer to the ballpark map for restroom locations. In addition, the Field has three family restrooms located on the Concourse Level down the Security Corridor at 101, and by Sections 105 and 116. All bags are subject to search upon entry and within Greater Nevada Field and must be smaller than 16''x 16'' x 8'' inches. Prohibited items should be disposed of in trash containers or returned to one's vehicle prior to entry (see PROHIBITED ITEMS). Dimensions: To left field, 345 ft.; to right field, 339 ft., to center field, 400 ft.
For the safety of our guests, ball retrievers and fishing nets are not permitted in Greater Nevada Field during Aces games. Guests must return them to their car before entering the Field. Ball retrievers or fishing nets confiscated inside the Field will not be returned. -They do not obstruct the site line of another guest. -They are not in the field of play. -They do not cover up any existing signage. -They are not political or commercial in nature. -They are not paraded around the stadium. -They are not in poor taste. Management reserves the right to remove any bats from Greater Nevada Field at any time for any reason they find necessary. Baseball bats are permitted for autographs before the game only! Once the batting cage is pulled (15 min. before game time), all bats must be checked in at the Guest Relations at Section 105 for pick up after the game. Greater Nevada Field gates open one hour before game time allowing guests to view infield practice for both teams. Unfortunately, Aces batting practice occurs over three hours before the game, well before gates open. Beach balls and all other inflatable items are not permitted at Greater Nevada Field. For the safety of our guests, brooms, and flag poles are not permitted at the Field. On days that the Aces are going for a sweep, small whiskbrooms will be permitted. Brooms may not exceed three feet in height. No sticks, and/or metal poles of any type are permitted at any time. Guests are not allowed to bring any outside beverages, cans or glass bottles into Greater Nevada Field. The following items are permitted: unopened, soft-sided containers of drinks such as water, small milk cartons, juice boxes or pouches, baby formula, bottles and baby food, and medication or other special needs. Please note: permitted sealed bottled water only applies to water without ANYTHING added to it. Examples of drinks that are NOT allowed in the Field are soda, Vitamin Water, Propel, Sports Drinks or other flavored water. Bike racks are available during every game and events and is located near the Media Entrance (ME) gate on Kuenzli Street Bridge or in the Suite Holder Valet Parking Lot. Please make sure to bring your own locking mechanism to secure your personal bike as the Reno Aces are not responsible for stolen or damaged bicycles. Radio broadcast of Aces games can be found on Fox Sports Radio 630 AM with announcer Ryan Radtke. Broadcasts can also be heard through the RenoAces.com website. These items are not permitted into the ballpark at any time. Cameras and videos are allowed in Greater Nevada Field during all regular season baseball games as long as they are not for commercial use. Both cameras and videos must be hand held; tripods cannot be set up in the seating areas or the aisles (monopods are allowed), and must not block the view of the ball game for other guests. DVDs of pre-game and in-game performances and events are available for purchase. For more information please contact the Front Office at (775) 334-4700. An official game consists of 4 ½ innings if the home team is leading or 5 full innings of the game is tied or if the visiting team is leading. Should the regular season game identified hereon not progress to or beyond a point of play constituting a regulation game, your ticket will be good for any 2017 regular-season home game, subject to exclusions and ticket availability. Your ticket may be exchanged for a ticket of the same price by either mailing or presenting to the Reno Aces Ticket Office. Should any exhibition or post-season game identified hereon not progress to or beyond a point of play constituting a regulation game, retain possession of this ticket until the Rain Check policy is announced. Rain Checks will not be honored for any regulation or suspended game which has progressed to or beyond a point of play described in Section 4.10(c) of the National Association of Professional Baseball Leagues Rule Book. All bags must be no larger than 16" x 16" x 8". All bags, including backpacks and purses, are subject to search. No cans, weapons, glass containers or alcohol are allowed into Greater Nevada Field at any time. No hard-sided coolers of any size are permitted. Diaper bags are permitted in regardless of size, for guests accompanied by their babies. Strollers must be small enough to keep out of walkways and aisles or be checked into Guest Services at Section 105. 16''x16''x8"). Large bags may not be emptied and rolled into fit another bag. Guest cellular phones are allowed as long as they do not distract from the enjoyment of other guests. Repeated use may constitute a warning. Failure to comply may result in being asked to check the phone in at Guest Relations. Guests will be asked to step out of the seating area. representative at the gate of entrance to search items being brought into Greater Nevada Field. -Guests will show their ticket when requested and sit only in their ticketed seat. -Guests will enjoy the baseball experience free from foul/abusive language or obscene gestures. -Obscene or indecent clothing will not detract from the guest experience. -Guests will refrain from smoking in any all areas of the Field as Greater Nevada Field is a Smoke Free facility. -Guests will refrain from displays of affection not appropriate in a public, family setting. -Intervention from an impaired or intoxicated guest will be handled in a prompt and safe manner. All requests must be submitted two weeks prior to the event. The request must be submitted in writing on the organization's letterhead. The letter should include a contact person's name, phone number, tax id number and a deadline for response. Information on the Community Relations Department is available by phoning the office at (775) 334-4700. To encourage Guests to drink responsibly, anyone who has a valid driver's license and is of legal drinking age (21 years old) is eligible for the Designated Driver Program, which entitles them to a complimentary soda. Designated Driver signup is located at Guest Relations behind Section 105. For additional information regarding Disability Services, please call (775) 334-7036 or click here. Guests with tickets for Sections 101-107, including Coors Light Party Zone, should use the Rotunda Entrance Gate. For access to Sections 108-120, suites and berm seating, guests should use the Home Plate Entrance. Amplificative devices for guests with hearing impairments are available to check out at Guest Relations behind Section 105. There is a guest drop-off zone located on Evans Street and Kuenzli. This drop-off location is open to guests at all times before and throughout the game. Two hours prior to the game, Evans running North and South will be closed and will be re-opened at the end of the game. There is a public elevator located on the Main Concourse at Section 108. This accesses the Dugout Club, Suites and Team Administrative Offices. For access to the Freight House, there is an elevator behind Section 103 and on the front plaza. All ballpark entry gates are disabled accessible. Emergency treatment or general care is available at the First Aid Office behind Section 113. There is limited number of disabled parking spaces available in the suite holder valet lot, which can be accessed on Lake Street. Guests must present a valid state-issued placard to valet attendant. The valet lot opens two hours prior to game time. Once the valet lot is at full capacity, disabled guests are more than welcome to drop off any other guests at our drop-off locations and park their vehicle at any of the available parking garages downtown. All ballpark restrooms accommodate wheelchairs. All water fountains throughout Greater Nevada Field are disabled accessible. Service animals are permitted in all areas where guests are allowed. Service animals are animals that are individually trained to perform tasks for people with disabilities, such as guiding people who are blind, alerting people who are deaf, pulling wheelchairs, or performing other special tasks. Service animals are working animals, not pets. Wheelchair accessible seating is located throughout Greater Nevada Field at all price levels. Companion seats adjacent to wheelchair accessible seating are available throughout the Field. Please contact the Ticket Office at (775)334-7000 for further information on how to purchase a wheelchair accessible seat. Disabled seats are also available throughout the Field in all Season Ticket Packages. For information call (775) 334-4700. All restrooms will also accommodate guests in wheelchairs or with special needs. Wheelchairs are available for check-out with a valid driver's license or identification card in Guest Relations, located behind Section 105. *For day of game assistance or questions regarding our disability services while at the ballpark, please feel free to visit the Guest Relations Office behind Section 105. Drinking fountains are located on the main concourse behind Sections 103, 109, and 118. All fans driving to Greater Nevada Field should be advised that Evans Avenue will be closed to traffic between 2nd and 4th Streets. Fans coming in from the north and south on 395 are encouraged to take the Mill Street Exit westbound to Lake Street. Drivers dropping off handicapped fans at the Field may want to consider the 2nd Street/Glendale Exit westbound. However, travel will be slow on Kuenzli Street westbound approaching the Field, as traffic will be narrowed to one lane to accommodate the drop-off location. Additionally, fans planning to park in the Truckee River Office Tower south of the Field will be unable to turn left to access the garage from westbound 2nd/Kuenzli Street. Fans coming in from the east and west on 80 are encouraged to take the Virginia/Sierra Street Exits. Fans leaving the downtown parking areas are encouraged to use both Sierra and Center Streets for easiest departure. Fans using the Wells Avenue Exit will be directed to turn right at 6th Street and left at Lake Street. There is a guest drop-off zone located westbound along 2nd/Kuenzli just before Evans Avenue. There is a public elevator located on Main Concourse at Section 108, This elevator accesses the Suites and Team Administrative Offices. Greater Nevada Field does not offer Exit/Re-entry Privileges. Once a guest has exited the facility their ticket will not be valid for entry again. Part-time, event-driven positions are available at Greater Nevada Field and most shifts occur during evenings and weekends. A list of any available positions are available under the Contact Us tab at the top of the page or by calling our Job Hotline at (775) 334-4700 or by stopping by Guest Relations which is located on the Main Concourse at Section 105 during an event. There are three (3) family restrooms available for use. They are located at Sections 101 (Security Corridor), 105, and 116. The Aces do not encourage mailing items to be autographed. The Aces staff is not responsible for items that are not autographed or returned. In accordance with Pacific Coast League rules, only authorized personnel with proper credentials will be permitted on the field, before, during or after a game or event. Any unauthorized person who travels onto the field will be removed from Greater Nevada Field and subject to arrest and prosecution, permanent expulsion from the Field, and loss of season tickets. The First Aid Office is located at Section 113 on the Main Concourse down the right field line. Pacific Coast League rules state that guests are not allowed to bring any outside food items into Greater Nevada Field. Fans will be allowed to bring in reasonably-sized bags of peanuts and/or sunflower seeds only. No exceptions. Professional Sports Catering provides food and beverage services for the entire ballpark. For questions or concerns about Levy services or catering information, please contact them at (775) 334-7090. Guests may keep any balls hit into the stands. Batted balls can be dangerous, so we ask that guests stay alert at all times. When attempting to catch a foul or home run ball please do not interfere with the game in progress and be respectful of other guests. At no time should a foul or home run ball be thrown back on the field. Guests who fail to adhere to these rules face immediate ejection from Greater Nevada Field and will be subject to arrest and prosecution. There are two main entrances to Greater Nevada Field: the Rotunda Entrance (RE) Gate (all ticketed access) and the Home Plate entrance (HP) Gate (restricted access). Gates will open one (1) hour prior to the start of a baseball game and at designated times for all other events. *Subject to change on selected dates. Opening Night the Ballpark will open 1.5 hours prior to game time. Additional games may be added or subtracted at a later date. Guest Relations is located on the Main Concourse behind Section 105 The friendly and knowledgeable Guest Relations staff is available to assist our guests with potential questions, comments, or concerns. From Greater Nevada Field policies to the nearest specialty food stands, our guests' needs are our top priority for the Guest Relations staff. Open for business from gate opening until the crowd clears, Guest Relations is in place to help ensure that our guests receive outstanding customer service at the Field. In-seat food and beverage service is offered to all Dugout Club and Home Plate Premium ticket holders at all Aces home games. Professional Sports Catering servers will take and deliver orders so you will not miss any action on the field. Servers cannot provide service to anyone other than these seat ticket holders. Information on Archie's Kids Club can be found by contacting the Front Office at (775) 334-4700. Kids Club is usually announce the March prior to each Aces season and is free to children 3-12 years old. Greater Nevada Field kids areas is available for guests 12 and under. Playground equipment and climb toys are available for children in the centerfield corner, adjacent to the Berm seating. Laser pointers and similar items are prohibited. Anyone who is observed using a laser pointer will be ejected from the ballpark and the device to be confiscated. Any laser pointer, which is confiscated, will not be returned. Greater Nevada Field has one (1) general admission lawn seating area, located in Right Field. Tickets for this area may be purchased in advance or on the day of the event, however seating in these areas is available on a first-come, first-served basis. Guests holding tickets for the lawn are encouraged to arrive early for preferred seating. Guests are permitted to bring towels, blankets or lawn chairs for use in these areas. Low back beach style chairs are recommended. Chaise lounges and lounge style chairs will not be permitted. Umbrellas may be used to provide shade in the lawn area, however in consideration of the safety and sight lines of others; we ask that guests using umbrellas sit in the upper portion of the lawn areas. In the event that an umbrella interferes with the view of another guest, you will be asked to close the umbrella. Reno Aces Management reserves the right to refuse any chair or umbrella deemed inappropriate due to size or otherwise. Found items are taken to the Guest Relations at Section 105 as soon as possible. Items are immediately logged and kept there until the crowd has completely exited Greater Nevada Field after each game. Guests may call during business hours 9 am to 5 pm, Monday-Friday at (775) 334-4700 to check on their missing item. Arrangements can then be made for pick-up. The Nightly Suite is an ideal setting to entertain smaller groups of clients or friends with a catered menu and wait service. This suite holds up to 20 guests, which includes 12 outdoor veranda seats and lavish indoor seating area. Call (775) 334-4700 to reserve your night in one of our Luxury Suites! Archie, the Reno Aces mascot, is available for appearances and community events. Please contact the Front Office at (775) 334-4700 for further information, or fill out and return the Archie Appearance Request Form. The Biggest Little Team Shop in the World is located at Greater Nevada Field, and has the widest selection of Reno Aces gear. Aces merchandise may also be purchased online at aces.milbstore.com. All merchandise sales are final at the Team Shop; no refunds. Exchanges may be made only if the original tags and labels are attached. An a cappella tape or CD of the performer singing the anthem must be submitted to be considered. Noisemakers, cowbells, air horns (natural), drums, and all items that make a noise are allowed in the ballpark. However, their use, frequency, and location are at the discretion of management. If there are complaints about these items being used, their use should be stopped. If necessary, the item may be checked into the Guest Relations, behind section 105 on the concourse, until the end of the game. The Reno Aces do not have a dedicated parking structure for Greater Nevada Field. Guests are encouraged to arrive early and park in any of the 21 downtown area lots that are within walking distance of the ballpark. With regards to parking in the Basin Street Office Tower, westbound traffic on 2nd Street/Kuenzli Street will be unable to turn left to access the garage. For eastbound traffic on 2nd Street, the right lane will be dedicated solely for traffic accessing the Office Tower garage. Following the game, all traffic exiting the garage must turn right on eastbound 2nd Street. Parking adjacent to the Police Station between 2nd, Kuenzli and High Streets is reserved for on-duty police business only. All others will be towed. Valet Parking is available just off of Lake Street for suite holders and disabled guests with government-issued placards. Anyone wishing to distribute leaflets must receive written permission from the Reno Aces Operations Department. Petitioners are allowed to seek signatures from guests in the parking lots away from all Field entrances. The Operations Department can be contacted by calling (775) 334-7036. Paging of guests is not permitted unless the situation is an emergency. Refer requests and phone calls deemed emergencies to the Ballpark Security Office down the Security Corridor behind Section 101. Promotional giveaways are available at various games throughout the season. Age restrictions, limited distribution, and other limitations are specified for each promotion. -Guests must enter through the Rotunda Entrance (RE Gate). No giveaways will be distributed through the Home Plate Entrance (HP Gate) or Freight House District entrances. -Anyone going through an entry gate which does not have the promotional item will not be able to obtain the item from inside the Field at another gate. -Each eligible guest must receive the item immediately after entering the gate, unless specified otherwise. -Only one item is given to each guest, regardless of how many tickets they may possess. -Special questions pertaining to Promotional Giveaways can be referred to the Guest Relations office behind Section 105. -Gates open one hour before game time for all giveaway distributions and have quantity limitations. -Kids who enter for free (under 3 years of age) must have a ticket in order to receive a giveaway item. Press with passes enter Greater Nevada Field through the Media Entrance Gate on Kuenzli. Press passes can be picked up at the Security Corridor. A great alternative to parking is to take public transit to the ballpark. RTC RIDE provides service throughout Reno / Sparks. The main transit center in downtown Reno is located at Fourth and Center streets, just a short walk to Greater Nevada Field. For routes and schedules visit the RTC website at www.rtcwashoe.com. RTC SIERRA SPIRIT is a free circulator providing trips all around downtown Reno, to the University, and back- FREE. Route and schedule information is posted at www.rtcwashoe.com. The service operates every 10 minutes, every day, from 7 a.m. to 9 p.m. Fans can walk a few blocks from to Greater Nevada Field from several stops along the way. For questions about public transit, call RTC Passenger Services at 775-348-RIDE (348-7433) seven days a week from 7 a.m. to 7 p.m.
An official game consists of 4 1/2 innings if the home team is leading or 5 full innings if the game is tied or if the visiting team is leading. If weather or another unexpected event prevents the game from reaching those durations, the purchased ticket may be used as a rain check. In this case, the ticket may be exchanged for a ticket or equal value, based on seating availability, for any future regular season home game. According to Pacific Coast League Rules, the home team is the sole judge of the conditions of the playing field, prior to the start of the game. The umpire-in-chief shall be the sole judge as to whether and when play shall be suspended during a game because of unsuitable weather conditions or the unfit condition of the playing field; as to whether and when the play shall be resumed after such suspension; and as to whether and when a game shall be terminated after such suspension. The umpire-in-chief shall not call the game until at least one hour and 15 minutes after he has suspended play. He may continue the suspension as long as he believes there is any chance to resume play. He shall not call the game until at least 45 minutes after he has suspended play for a second time. The umpire-in-chief shall at all times try to complete a game. His authority to resume play following one or more suspensions shall be absolute and he shall terminate a game only when there appears to be no possibility of completing the ballgame. All county and city ordinances apply on property. The City of Reno and the Reno Aces prohibit the resale of tickets on Greater Nevada Field property. This includes Greater Nevada Field, as well as property surrounds Freight House District area. Guests can send birthday, anniversary, and/or special shoutouts to family and friends on Greater Nevada Field's video board. The readings are limited in length and must be received 48 hours prior to being run. E-mail all requests to Shaun Tatz at statz@renoaces.com. The ballpark Security Office is located in corridor behind Section 101 (Gate EE) on the Main Concourse. The Security Office is the site of 24/7 Security. Greater Nevada Field is a smoke-free facility and smoking is prohibited in all seating areas, the concourse, restrooms, concession stands, eating areas, suites, and administrative offices. Guests can exit through the Media Entrance behind Section 116 to smoke. A valid ticket is required for re-entry into the ballpark. Guests can call local Taxi companies for a safe ride to and from the ballpark. All guests 36 months or older must have an appropriate ticket for entry for baseball games (other events are subject to all guests required to have a ticket). Toddlers under 36 months do not need a ticket to enter the Ballpark, but they must sit on the lap of an accompanying adult. Please be considerate to those seated around you. Strollers are permitted for entry. Strollers, however, must be small enough or collapsible to keep out of walkways and aisles and placed under seats, or be checked at Guest Relations at Section 105. All guests 36 months or older must have an appropriate ticket for entry. Toddlers under 36 months do not need a ticket to enter the ballpark, but they must sit on the lap of an accompanying adult. Please be considerate to those seated around you. For information by telephone regarding tickets, call (775) 334-4700. For information on group tickets and suite options, or ticket plans visit the Tickets & Promotions tab at the top of the page. Prices for individual game tickets range from $8 to $35. For a complete look at single-game ticket pricing, visit the Tickets & Promotions tab at the top of the page. -Assistance with Group orders and questions. -Season Ticket Holder questions, needs, and concerns. The Greater Nevada Field Ticket Office is located on the west side of the ballpark at the Rotunda Entrance Gate and is open on Monday-Friday, 10 a.m. - 5 p.m. and Saturdays, 10 a.m. - 4 p.m., closed on Sunday (except game days). The Ticket Office can be reached by calling (775) 334-7000. The Ticket Office is also open for every Aces home game at 10:00 am and will remain open until the 7th inning. For the safety of all guests, weapons of any kind are not permitted in Greater Nevada Field. The only exception to this policy is law enforcement personnel in the performance of their official duties. Guests wishing to enter the ballpark for a game or event consent to a reasonable search for weapons before entering. Failure to comply with the above conditions will be denied admittance or may be ejected. No refunds or exchanges will be allowed in such an event. All Will Call tickets can be picked up at the Greater Nevada Field Ticket Office, located on the Event Plaza on the west side of the ballpark. On gamedays, Will Call opens at 10:00 a.m., and closes in the middle of the 7th inning. On non-gamedays Monday thru Friday, Will Call opens at 10 a.m., and closes at 5 p.m; on non-gameday Saturdays, Will Call opens at 10 a.m., and closes at 4 p.m; Will Call is closed on Sunday when there is no game. All guests must show picture identification at Will Call in order to pick up their tickets. Guests may also leave tickets at these windows.